I’m not one of the “gamerati” currently up in Niagara Falls at the moment, but as I attended a local charity game convention Saturday, I thought I’d make a brief post as it may inspire others to do the same. 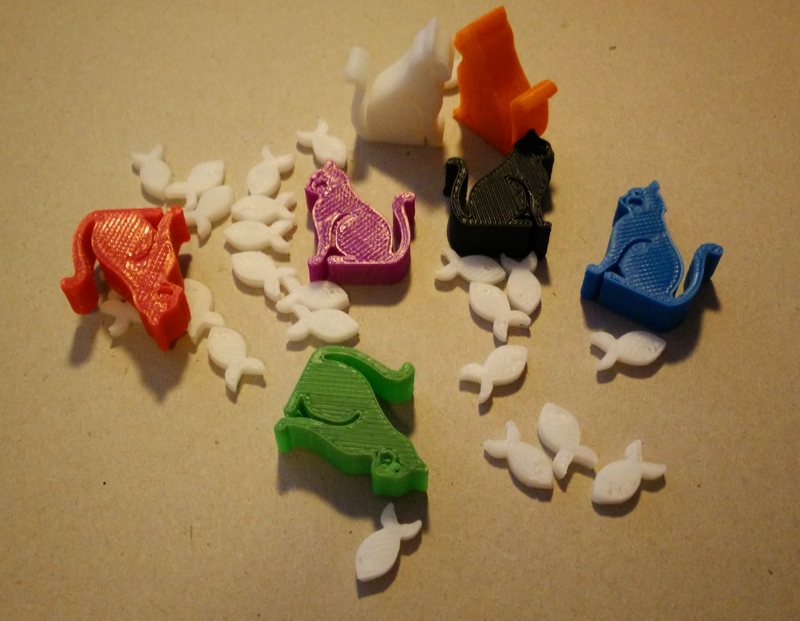 In brief, I had a good time teaching beginner games to a host of new gamers. 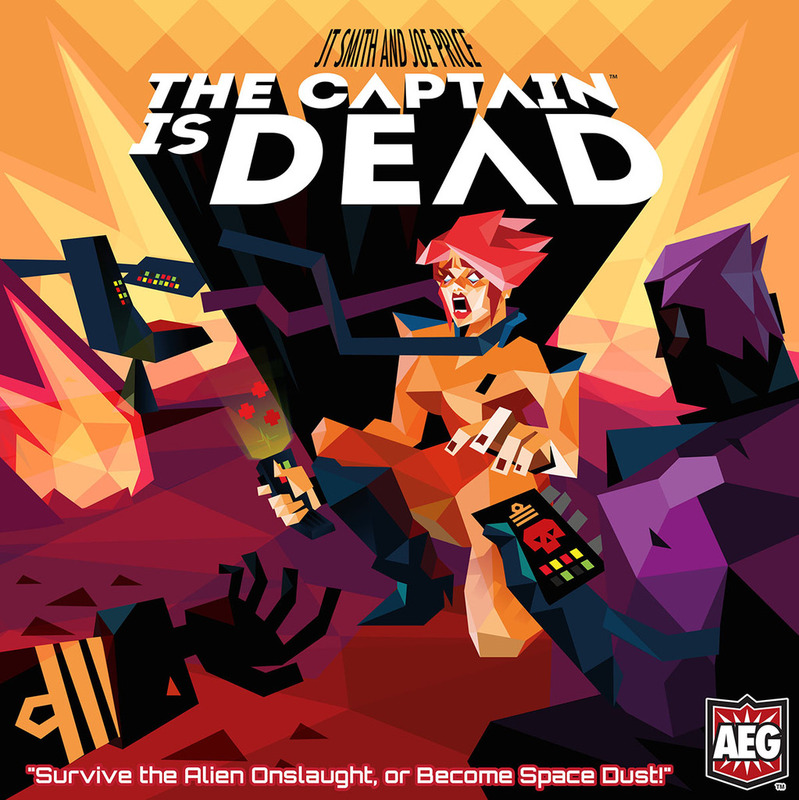 The star of my day was a 5 player game of the AEG rerelease of The Captain is Dead. 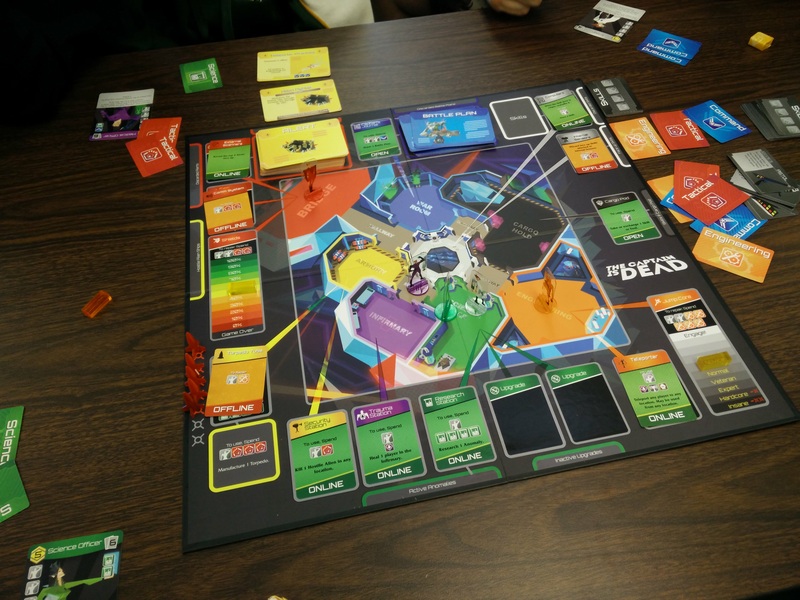 A close second place was repeated plays of Escape: The Curse of the Temple with some brand-new-to-gaming sophomores. The local game shop, The Sage’s Shoppe (complete with extra letters) paired with a couple gamer high school teachers to host an all-day gameathon in order to raise money for the school’s summer backpack program. Low income kids often have their only decent meal of the day at school, so they are given backpacks full of food for the weekends so they can have a good meal on Saturday and Sunday, too. The summer program attempts to help with this over the summer months when school is not in session. Staffed with student and teacher volunteers, the school cafeteria was open 9am to 9pm for open gaming with a few casual tournaments throughout the day (Formula D, Magic: the Gathering, and Dice Masters although I’d hazard only a quarter of attendees participated in a tournament.) I showed up around 10am and stayed to the end, with my preteen boys hanging around for most of the afternoon. As I mentioned, the star of the day was my game of The Captain is Dead with a good friend (the organizer) and three of his non-gaming students. The game was new to almost all of us (I had played once several years ago) so the setup and explanation took a bit longer than normal but we were up and running in about 15 minutes. Close up of the spiffy new transparent character standees, one for each of the 18 characters. The game has been around a few years I’ll take a brief paragraph to explain the rules for folks who have not yet played the game. Players take on unique roles on a starship under attack just after the captain has died. Each turn, and Alert card damages the ship or its systems and the players must rush about the ship keeping its important systems operational while trying to repair the jump drive. While systems will come and go, the game is won when the jump drive is finally repaired. Characters have action points which can be spent in moving and various other tasks. Most tasks, such as repairing, also require skill cards which can be drawn (with action) from the computer core. Each character has a skill “discount” for one or two of the four skill types, which allows that character to spend fewer cards of that type. Thus, the game primarily consists of characters running around the ship trying to get the right people in the right places with the right skill cards in order to keep the ship running and eventually engage the jump drive. As the game goes on, the Alert cards get progressively worse, so any dilly dallying of the crew will pan out poorly for the ship. I felt the game was a solid design but what is going to make or break the game for players is the theme. The Alert cards and ship systems give a taste of the spaceship but the characters and their powers are the star of the show. There are 18 different characters in seven different colors. It’s best not to play with more than one of a given color, as their abilities will tend to overlap. In our game we had a Medical Officer (heals folks), a Science Officer (repairs science-y stuff and creates technology upgrades), a Teleporter Chief (two free teleports a turn), an Ensign, and Crewman. Most of our laughter (and there was a lot) was centered on the Ensign and Crewman. 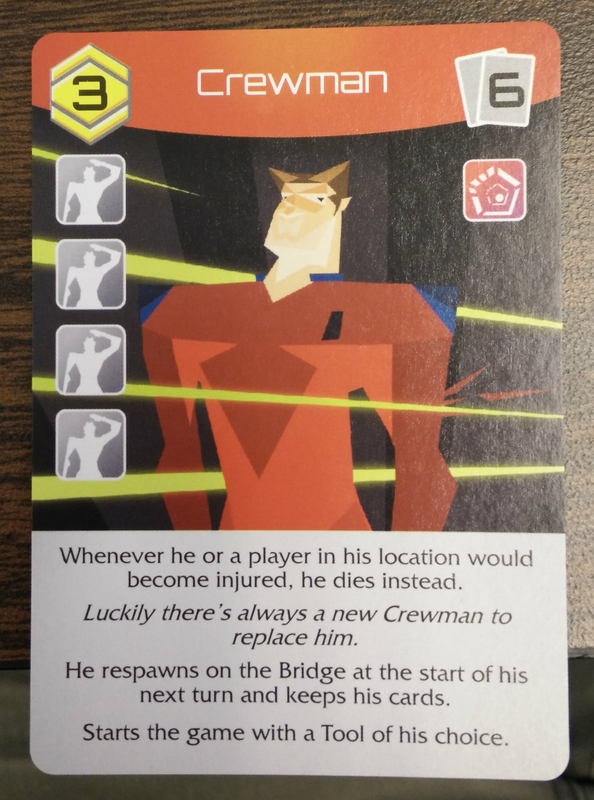 The Crewman is a red (obviously) character who is never injured, he simply dies and then reappears on the bridge. In fact, if anyone else in his room is about to die, he dies instead and then reappears on the bridge. We felt it necessary to call out “Boop!” every time he reset on the bridge. I believe only two people on the crew were ever injured, but the red-shirted Crewman managed to die somewhere approaching a dozen times. It drives home how valuable those redshirts are for keeping a spaceship operational. The Ensign had no skill discounts, but he could move fast and could trade cards freely (without actions) with anyone and everyone. Need a phaser? 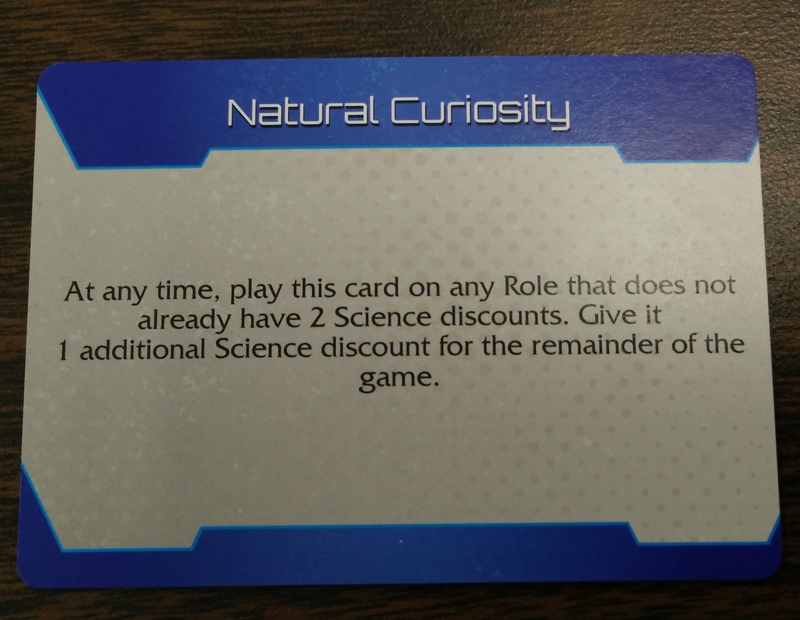 “Ensign to the Bridge!” Out of skill cards in the science lab? “Ensign, report to the science lab!” Such was our game’s bread and butter for humor. Aside from the constant “Boop!” of our Crewman, two incidents stand out. The first was when the science officer ran to the cargo room to pick up a laser rifle. Running back to the CPU core with the rifle, he promptly ran out of actions to use the gun and handed it to the next candidate, the Medical Officer, who then mowed down a roomful of aliens. I could just see it “Hey I got a huge gun, what do I do with it?” “Give it here, I pledge to Do No Harm excepting any alien scum who to try to hurt MY crewmembers!” The second was the climax of the game. While the ship was slowly breaking into bits (several systems were completely destroyed – not just offline), the Ensign made his way into the Science Lab, bodily picked up the Teleporter Chief, carried him to Engineering, plunked him down in front of the Jump Drive system, and then handed him the skill cards he needed to complete the Jump Drive repairs. After all, isn’t that what a good gofer is for? Our intrepid Ensign plots his route to make his next delivery. I liked the game but it wasn’t perfect. The rulebook leaned heavily on the board and card text to explain what everything does. This led to a couple of things that weren’t quite clear enough for us. However, they were so minor, even if we played them wrong they weren’t going to affect the game. My one small quibble was with the Battle Plans. A few of them granted a character a new skill discount. We just slid the card underneath a player’s character card to remind us of the addition. However, the game uses such great iconography to keep all the actions and functions clear, would it have been so hard to just add an appropriate skill icon to the Battle Plan card so it would show up when we put it under a character card? Sure one could just remember, but if a character started to get several improvements it might be tricker to always remember. Seems like a wasted opportunity for more clarity. Is a little Science Icon on the card so much to ask? After playing the basic game their pulses were racing and we gave the curse and treasure expansion a try (we lost.) They even had the enthusiasm for one more game, so we played with a few special rooms and player powers. Everyone had fun and several declared this was the game they were going to write about for English class. Hah! 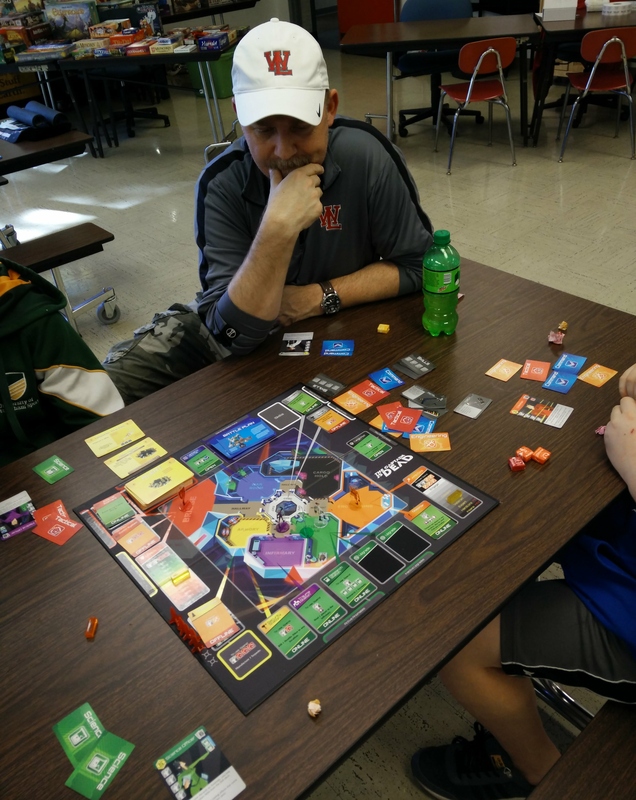 It turns out the English teacher – one of the organizers – gave extra credit for attending and writing up something about the games… Turns out it was a great way to get some kids interested in boardgames. They have a club that plays games during the 50-minute lunch hour. There were other games played, a nice round of Sentinels of the Multiverse, teaching several kids how to play Crokinole, but The Captain is Dead and Escape the Curse of the Temple were the two highlights. The entire day ran smoothly, people used an ID to check out games and return them, and between the game store and a few personal collections there were plenty of options for gaming. A small snack bar also brought in a bit of additional fundraising money. I think the net total raised for the day was around $1000. I believe this is the third year running the fundraiser was held and it continues to gather momentum each year. If you are aware of specific needs at your local high school, and know a local game store with whom you could partner, I’d recommend the “GameCon” as fundraiser idea. 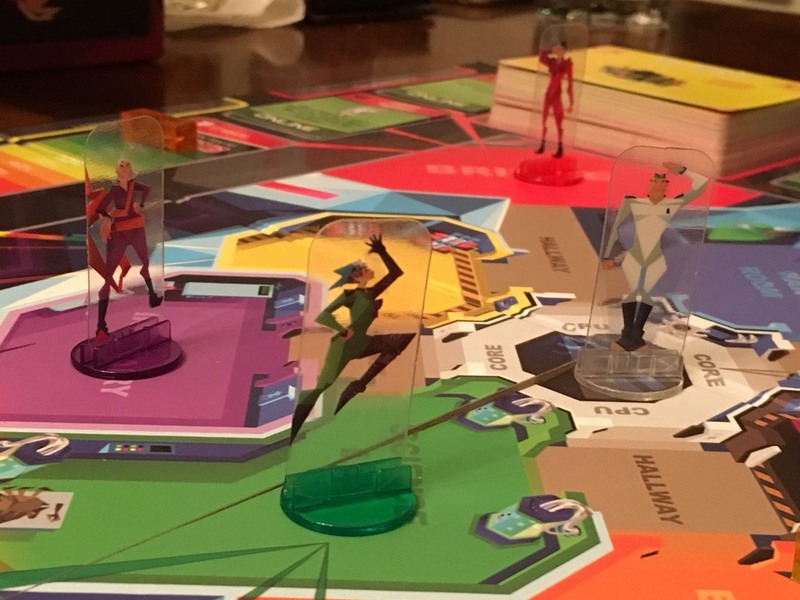 This entry was posted in Convention Report, Reviews, Sessions and tagged charity, fundraiser, GameCon, The Captain is Dead. Bookmark the permalink.